High Demand, so availability may be thin! 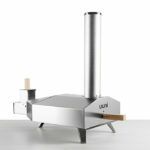 You’ll be talk of the town with this impressive pizza oven made by Uuni, the Scandinavian firm have gone one better than last time and now offer this evolution from their previous pizza appliance. Again, it displays the versatility, durability and sleek style but it’s now developed from its predecessor with improved heat efficiency, better temperature control, trusted stability and is easy to pack away and move around. In-fact, much of the appeal of this quality oven is that it not only has a resilient design made to last but it’s the world most portable pizza oven and can be enjoyed for any occasion. Invite your friends and family around to your garden and enjoy the taste of outdoor pizza that’s been cooked and prepared in your innovative wooden pellet pizza oven. Alternatively you can utilise its fantastic pack-away features and rather than bring the party to your pizza, take your pizza to the party. Wherever you may be, you can enjoy a freshly baked favourite, take it to another garden party, the beach or out in the middle of nowhere, there are no limitations. As you can already tell – this product has done a lot to impress our team and we’re not the only oven experts to be astonished by their flawless creation, with sites such as Amazon and other popular retailers all receiving rave reviews and rating it at five stars. It seems to be one of the most popular on the market and is very reasonably priced when you take into account all of the features that it showcases. 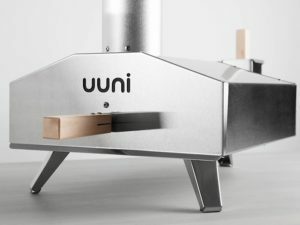 Why is the Uuni 3 Pizza Oven so good? Where do we start! It’s a wood-fired oven, a rare commodity that can now be enjoyed in contrast to the typical gas ovens many rely on. It also has a wood pellet burner, stone baking board, is easy to use and comes complete with a pizza peel. You can easily cook for many and seamlessly pull out your pizza with its wooden handle on the door and hopper. It takes just ten minutes to reach a temperature of 500C and the great thing about this improved model is that it maintains that heat and ensures that it evenly cooks your pizza throughout. It weighs less than 13kg and can cook some pizzas in less than sixty seconds, plus it can also be used for steaks and vegetables. Verdict: It’s little wonder this is one of the best selling pizza ovens of 2017 and we think it will continue to be a popular choice for years to come – at least until the next Uuni model is released!